Do you love easy home cooked recipes? If so you’ll love this one! A nice warm bowl of soup is one of my favorite things to eat during the winter month. Homemade chicken noodle, posole, vegetable soup are all at the top of my list! But you know what blows all of those away? 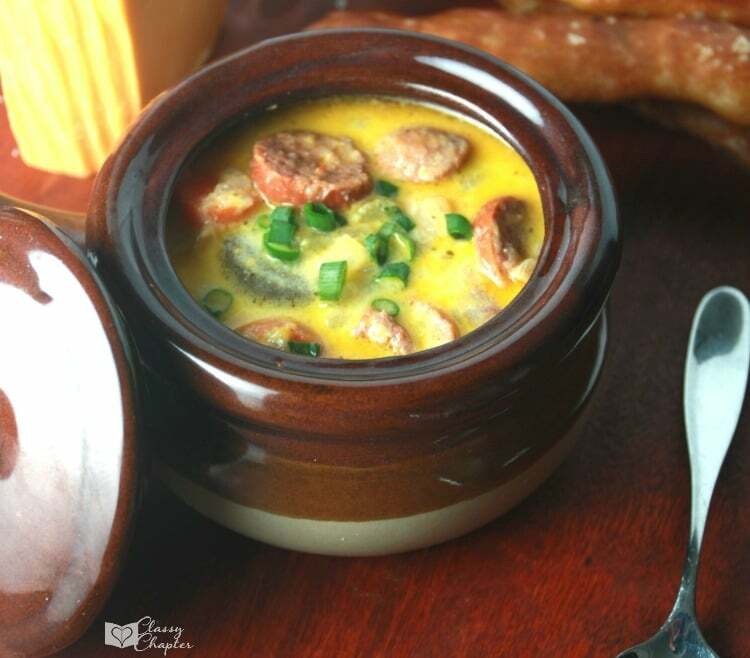 Louisiana Beer Cheese Soup! If you’ve never had this before you are seriously missing out. This stuff is amazing! Loaded with flavor and yummy goodness. This is a recipe that your friends and family will be begging you to make. I don’t think I’ve ever had a soup with so much flavor! My favorite part about this soup is it’s so easy to make. Easy to make and packed with flavor! 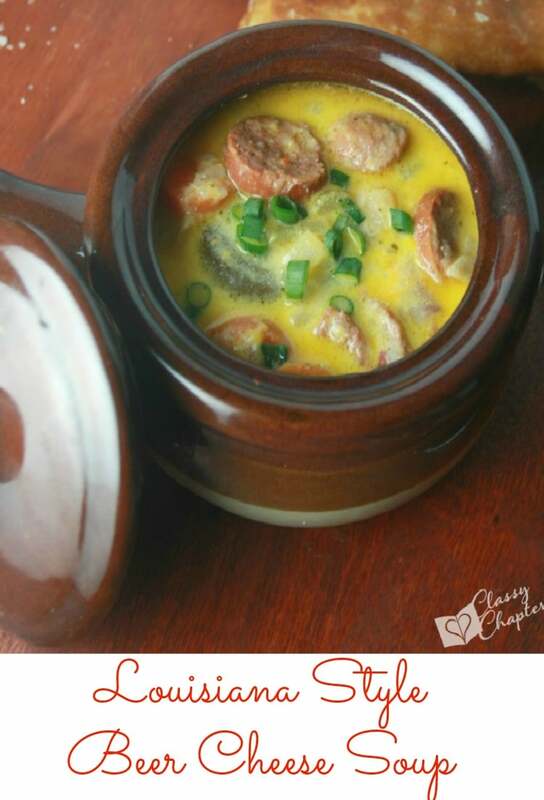 You can’t go wrong with this Louisiana Beer Style Soup! 1 package of hot links (I used Evergoods) sauteed and chopped. Add butter to a dutch oven or heavy stockpot. Once <g class=”gr_ gr_114 gr-alert gr_gramm Grammar only-ins doubleReplace replaceWithoutSep” id=”114″ data-gr-id=”114″>butter</g> has melted add in your carrots, onion and celery and cook for 10 minutes. Add in potatoes and garlic and cook an additional 10 minutes. Sprinkle the flour over your vegetables and cook for 2 minutes. Slowly add in your milk, half and half, beer, chicken broth, Worcestershire, hot pepper sauce, <g class=”gr_ gr_119 gr-alert gr_gramm Punctuation only-ins replaceWithoutSep” id=”119″ data-gr-id=”119″>cayenne</g> and mustards. Stir together and bring to a boil. Reduce <g class=”gr_ gr_117 gr-alert gr_gramm Grammar only-ins doubleReplace replaceWithoutSep” id=”117″ data-gr-id=”117″>heat</g> to low and cook for 20 minutes, stirring frequently. Remove from heat and slowly combine the shredded cheese, ensuring that everything is well combined. Place back on the heat and add in the hot links. Cook for 20 minutes, stirring frequently. This soup goes great with homemade pretzel sticks! 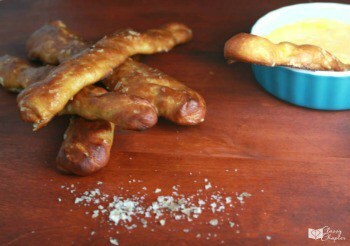 You can find my very simple Homemade Pretzel Sticks recipe below. OH MY MOUTH IS WATERING!! I am SO making this today! It’s chilly, damp, rainy and a perfect day for soup! I’ll probably have to ‘thin’ it down a bit by using some lower fat items but I bet it’s going to be spectacular! We love soup and really, soup is the ONLY thing I like about cold weather haha! Thanks for sharing this!